Are We There Yet?? : If There's a Birthday - There's a Cake! 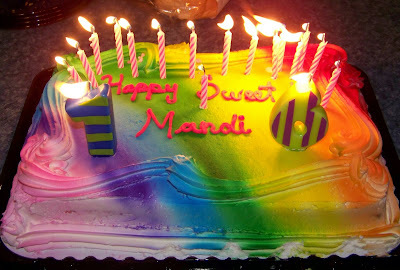 Amanda wanted a colorful cake for her birthday - I think this fit the bill, don't you? The Birthday "Queen" seems pleased! Happy Birthday again, kiddo, and best wishes for a fantastic year! She is indeed a Queen in royal regalia today. Happy Birthday Amanda! A rainbow cake! I love it. A colorful cake, indeed. Did Amanda design the cake? 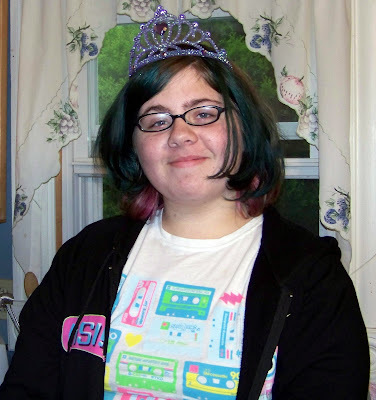 cake and a tiara! too cool!!! Sorry I was away on your birthday, Amanda. Happy 16th! Great looking CAKE! Happy Birthday Amanda! I am late...are there any leftovers?! I hope she had a wonderful sweet 16!